All Ethan Palmer wants is wheels of his own, and he's finally saved enough money to buy his dream car ... when he accidentally rams his dad's Volvo into their garage. It's not like his lawyer/politician father can't afford to pay for the damage, but of course his old man is going to turn this into another Big Life Lesson. With all his hard-earned cash going into repairs, Ethan won't be sliding behind the wheel of that Mustang Cobra any time soon. Or will he? He thinks he's found a way to make some easy money, and suddenly nothing is more important. Not school, not the girl he loves, not even the secrets that divide his family. For Ethan, it's all about payback. But he has no idea what his choices will cost him. Marsha: Running On Empty’s main character, Ethan, is anything but saintly, and this is not unusual for your young adult fiction. You seem to be able to nail the contemporary teen male mindset and voice. How do you do that? Don: I’m indebted to the hundreds of teenagers who have spent time in my classroom over the years. I’m convinced that I could never have become a YA writer if I hadn’t first been a teacher of young adults with endless opportunities to observe them interacting daily. I continually draw on those experiences, which not only inform the conflicts I write about but also provide the voices and mindsets of my characters. Marsha: This novel seems to have more profanity and sexual references than your earlier novels—don't get me wrong, it fits Ethan's character to a T, but I'm wondering if this reflects a change in editorial policy or something else. Don: I can’t comment on any change in editorial norms because the issue of profanity has never been raised by any of the editors I’ve worked with. I believe a writer should only use profanity if it suits the character and situation—otherwise, it’s gratuitous. Used unnecessarily, it can be a stumbling block, pulling readers out of a scene instead of drawing them forward. Ethan appeared in my head as a very angry young man, and it seemed natural that he would resort to swearing when his rage spilled over. Interestingly, I felt my use of profanity in Running on Empty was more moderate than in my previous novels, evidenced by my decision not to have Ethan use the f-word. I’ve learned to trust my instincts about what my characters will and won’t do, and as Ethan took shape, I found he was unlike the troubled young men who’ve appeared in my previous novels. Perhaps because of his background, I wasn’t comfortable “hearing” him use the f-word, even during scenes when he was incensed, which explains why that particular expletive doesn’t appear in the novel. Marsha: What was the inspiration for the novel? Don: Actually, it was a combination of inspirations that led me to write Running on Empty. While my younger daughter was attending university, she worked part-time as a server at a Halifax restaurant, and one of her occasional customers was a very poor man who always ordered the cheapest item on the menu and always left a dollar lottery ticket as a tip. One of those tickets won my daughter some cash, and I recorded that experience in my writer's notebook because I thought it might make an interesting scene one day. Months later, I attended a conference session during which the presenter, an educational psychologist, drew an analogy between cars and the teenaged brain—the brain of a teenager, he said, has a gas pedal but no brake—and that analogy resonated with me. Not long after that, I read a news article about a dramatic increase in the number of teenagers who gamble for money, and I was floored by the statistics the reporter offered, statistics that made me recall that psychologist’s comment. When something troubles me, I invariably find myself researching it, not necessarily because I want to write about it but because I need to understand it. Besides reading widely on the subject of gambling, I spoke to a number of people about it, among them an addictions counselor who shared heartbreaking stories about the toll that gambling has taken on the lives of individuals and entire families. But the most disturbing conversation I had was with a friend who told me about a married couple she knew who had a teenaged son. That summer, they “staked” him a sum of money that he used to gamble online—in effect, gambling was his “summer job” that year. He spent part of every day in front of the computer placing bets, and his parents actually boasted to their friends about the money he was making. The moment I heard about that young man, I visualized a character swept up in a gas-pedal-but-no-brake online experience, and it was then that the novel began to take shape in my head. However, it didn’t come easily. I struggled with the story for a long time because the last thing I wanted to write was an “issue novel” about gambling. The strongest stories are never about issues and events but, rather, how characters are affected by those issues and events. Before I can begin writing any story—whether short fiction or a novel—I first have to understand my main character well enough to determine what it is he or she wants more than anything else. Then it’s my job as a writer to keep that character from getting it, at least for a little while. Ethan, my main character, let me know very early in my writing process what he wanted most: a vintage Mustang Cobra SVT. Interestingly, however, what people think they want is often very different from what they really need, and this turned out to be true in Ethan’s case. Because I’m a father, I’m always interested in how family relationships influence a person’s choices, and I was intrigued by a line spoken in Alexander Sokurov’s film Father and Son: “A father’s love crucifies.” At first, I didn’t see how this could be possible—after all, a father who truly loves his children would only want what’s best for them. But the more I thought about this, the more I remembered mistakes I’ve made as a parent, which led me to realize that Running on Empty was more than a story of a teenager who gets swept up in gambling—it was a story about the uneasy dynamic between a father and son that results in choices both of them come to regret. Marsha: This is a contemporary story and the setting is where you live, but the scenes are so very detailed and the characters feel real. How did you do the research? Don: The statement “Writers write best when they write about what they know” may sound cliché, but it’s absolutely true—I can’t write realistically about a place I’ve never seen and spent time in. For example, when I realized that my novel The Space Between had to be set in Mexico, I arranged to spend some time there so I could record details about the places and the people, details that later made their way into the book. I never intentionally choose a setting because I think it will appeal to readers. I’m more concerned with creating strong characters that my readers can relate to, and those characters tell me where their stories need to take place. From the very beginning, I knew Ethan’s story had to unfold in Halifax, and the fact that I know the city so well was only part of the reason—the rest had to do with the escalation of violent crime that has occurred in Halifax in recent years. It seems as though every time I pick up a newspaper, I’m seeing stories of yet another beating or stabbing or shooting in that city, something that was rare a decade ago. Knowing that an act of violence would figure prominently in Running on Empty, I immediately envisioned it happening on a Halifax street. Regarding the creation of my characters, I like beginning with a “foundation” that I’m comfortable with, so I often use people I’ve known as models that I build my characters around. Eventually, as my story begins to take shape, each character evolves into so much more, stepping away from the model and becoming someone else entirely. It’s only as I’m writing the narrative that I truly understand my characters, discovering their backstories, adding flesh to their frames. For example, when I began Running on Empty, I knew that Ethan and his dad would have an uneasy relationship, but I didn’t know why. This was something I had to figure out as I watched them interact with each other on the page. Marsha: How long did it take you to write Running on Empty? Don: About four years. Around the time I was finishing my novel The Space Between, my wife and I sold our house and built another, and during this same period I accepted a new position as literacy mentor for my school board, events that consumed my life and reduced my writing output considerably. 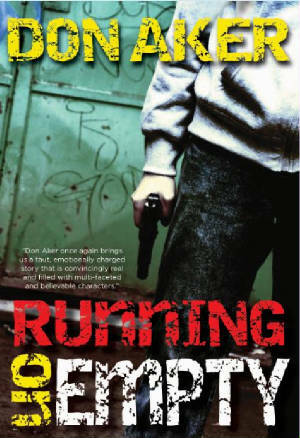 Over the course of two years, I struggled through a first draft of Running on Empty (which I’d initially titled The Grooming Ground), but I wasn’t happy with it. My agent, Marie Campbell, offered some terrific revision suggestions but, even after making those changes, I still didn’t feel confident with the manuscript—something about it wasn’t “right,” but I couldn’t put my finger on it. Despite my misgivings, Marie sold it to HarperCollins, and during the time that elapsed before the editing process began, I wrote The Fifth Rule, which HarperCollins also bought. I loved The Fifth Rule from the beginning and knew it was far stronger than Running on Empty, so I asked HarperCollins to publish The Fifth Rule first, which they did. During this entire time, I had continued to tinker with Running on Empty, but nothing I did seemed to solve the problems I sensed in the story but couldn’t articulate. However, I’ve been extremely fortunate to have worked with some of the best editors in the YA business, and Hadley Dyer is one of those. Her suggestions (and her slashing of 10,000 words from my original manuscript) were exactly the remedies my novel needed. Four years after starting it, I finally had a story I was proud of. Marsha: Did you write an outline before you wrote the book? Don: I wish I were an outline-writing kind of guy because I’m sure it would save me a lot of time and heartache. However, my process involves answering the three questions I mentioned earlier: who is my main character, what does he/she want more than anything, and how can I keep him/her from getting it (at least for a little while). Once I’m convinced I know the answers to all three of these questions, I begin with a first sentence and follow my character from there. Planning might occur on a subconscious level but, if it does, I’m completely unaware of it. If I knew what was going to happen, if I knew in advance how my story was going to end, I’d be bored slogging through the process of getting my character from point A to point B. What keeps me writing hundreds of pages is the simple desire to discover how everything turns out. Marsha: Who is your favourite character in the novel? Don: Ethan’s sister, Raye. I loved her the moment she appeared on the page, her blue hair going in all directions. Besides being funny and unafraid to say what she thinks, she’s fiercely loyal to both friends and family. I wish I’d had her courage at that age. Marsha: Which character is most like you? Don: Nineteenth-century French writer Guy de Maupassant said, “Whether we are describing a king, an assassin, a thief, an honest man, a prostitute, a nun, a young girl, or a stallholder in a market, it is always ourselves that we are describing.” There’s a lot of me in Ethan, at least the Don Aker I was at seventeen. Like Ethan, I was quick to judge, and I was forever feeling sorry for myself when things didn’t go my way. Marsha: What is your writing routine? Don: Most of each weekday is spent in front of my laptop. After breakfast, I usually take an hour-long walk along the bay to clear my head, and when I return, I sit down at my desk, reread what I wrote the day before, and then continue from there. I try to write until 4:00 (with a short break for lunch), but if a manuscript is giving me trouble, I’ll return to it again in the evening. My biggest problem is getting sidetracked by email. My wife gave me Julie Morgenstern’s book Never Check Email in the Morning, which sits prominently on my desk as a glaring reminder, but I tend to ignore that advice whenever LiveMail prompts me about a message in my inbox. Writing is such a solitary experience that any contact with the outside world can be a wonderful distraction. Marsha: What aspect of being a writer drives you nuts? Don: Keeping track of writing receipts. Author Peter DeVries once said, “I love being a writer. What I hate is the paperwork.” I could not agree more.